At the onset of the 21st Century, innovations in drilling technology led to significant increases in production in several U.S. oil and gas plays previously considered nearly tapped out or not highly productive. In the Bakken shale play in North Dakota, use of techniques combining horizontal drilling and hydraulic fracturing, popularly called "fracking," resulted in a dramatic increase in drilling and production. As the Bakken was proving profitable, exploration companies began targeting oil and associated natural gas in the Mississippian limestone play of Oklahoma. Following successes there, companies bought mineral rights in areas of southern and western Kansas, where Mississippian rocks and associated petroleum production extended into Kansas (fig. 1). Figure 1--Boundary of the Mississippian limestone play in Kansas. The upper boundary of the Mississippian play--a complex group of oil and gas reservoirs within a shared geologic and geographic setting--had already been delineated in Kansas using data collected from thousands of vertical wells over several decades. Colloquially known as the "Mississippi lime," the play attracted national oil and gas companies to areas previously dominated by smaller independent companies. Although not on nearly the same scale as in North Dakota, horizontal drilling in southern Kansas accelerated. The innovation of horizontal drilling and multistage hydraulic fracturing has been particularly important in the production of natural gas locked in deeply buried shales, such as the Woodford Shale in Oklahoma, the Barnett Shale in Texas, and the Fayetteville Shale in Arkansas. The Bakken shale, which extends from North Dakota and Montana into Canada, was one of the first plays in which advanced drilling techniques were successfully used to recover oil. Once the profitability of the new Bakken oil wells was proven in 2007, the number of rigs in North Dakota rose rapidly (fig. 2) and the economy boomed. Due in large part to the potential seen in the Mississippian limestone play, the horizontal rig count revived in Oklahoma after earlier declines. Interest in Kansas grew also, but the increase in rigs in the state through 2012 was modest in comparison to the two other states. Figure 2--Drilling rigs operating in North Dakota, Oklahoma, and Kansas between 2000 and 2012 (source: Baker Hughes). Although horizontal drilling and hydraulic fracturing techniques being used in the Mississippian play in Kansas are similar to those used in the Bakken shale and other plays in the United States, development and future production in Kansas cannot be predicted based on results in areas with different geologic settings and properties. How production in Kansas will stack up to that in North Dakota has yet to be determined. Table 1 shows a comparison between the geology, development, and production of the Mississippian limestone play in Kansas and the Bakken shale play in North Dakota as of early 2013. Table 1--Comparison between the Bakken shale play in North Dakota and the Mississippian limestone play in Kansas. bAPI gravity is an arbitrary measurement of relative density. Less dense, or lighter, petroleum products are easier to refine and, therefore, have a higher value. Heavy oils, with lower API gravities, are less valuable. A value of 30 °API or higher is considered light. Rocks deposited during the Mississippian Subperiod, spanning about 359 million to 323 million years ago (fig. 3), are found in the subsurface throughout most of Kansas. Exposed at the surface only in the extreme southeastern corner of the state, Mississippian rocks get progressively deeper from east to west. Mississippian rocks are oil-bearing in several parts of central and western Kansas, where they have been buried several thousand feet deep. Due to erosion, Mississippian rocks are absent along the crest of two now-buried structural highs--the Central Kansas uplift and the Nemaha uplift--although oil and gas production from the Mississippian is prevalent along the flanks of the uplifts (fig. 4). Mississippian rocks are also thin to absent on local anticlines but are relatively thick in synclines and basins. 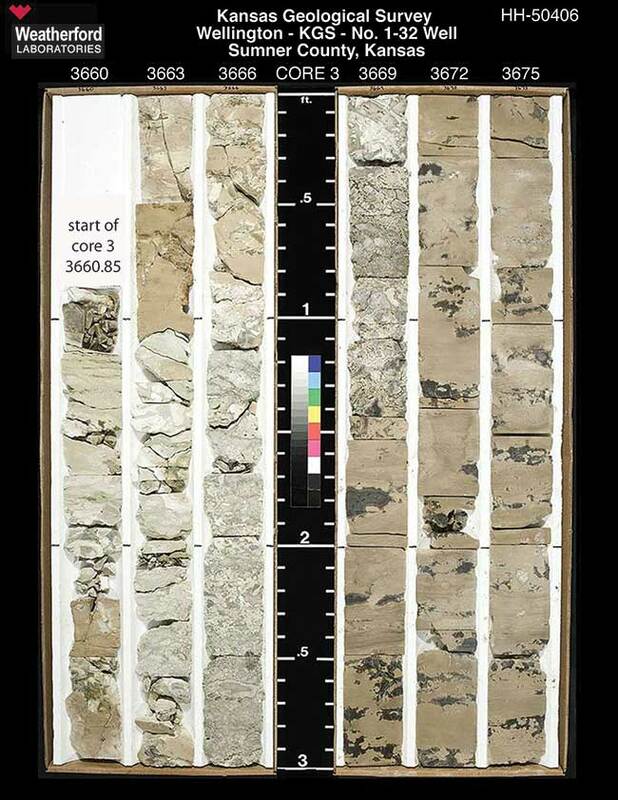 Figure 3--Geologic timetable for Kansas (modified from International Commission on Stratigraphy, 2012). 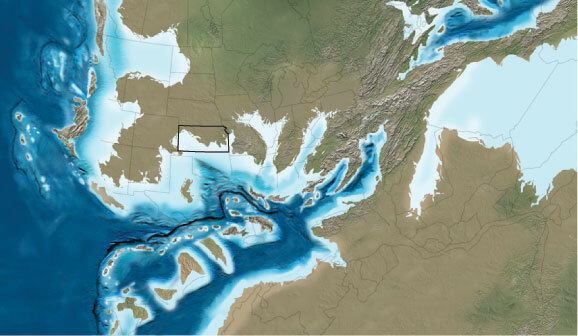 The Mississippian Subperiod of the Carboniferous Period lasted from about 359 million to 323 million years ago. Figure 4--Mississippian oil and gas production and the major subsurface structural elements in Kansas (modified from Newell et al., 1987). Figure 5--The southern portion of Kansas was inundated with shallow seas during the Late Mississippian Subperiod, when rocks from the Mississippian limestone play were deposited (modified from Blakey, 2010). Marine lime mud and shelly debris from seas that repeatedly advanced and regressed resulted in the Mississippian limestone and chert layers found in the subsurface of south-central Kansas (Watney et al., 2002). In what is now a porous and fractured target zone of the Mississippian play, the limestone, but not the more durable chert, dissolved through weathering during periods of exposure when sea levels dropped. This residual chert reservoir is informally called "chat" (fig. 6). Figure 6--Core from a well in the Wellington field in Sumner County. The core, which starts 2 ft (0.6 m) below the top of the Mississippian at 3,660.85 ft (1,116 m), is dominated by a cherty conglomerate, informally called "chat," that extends down to 3,670.5 ft (1,119 m). Mississippian rocks in Kansas can be divided into two general lithologic sequences. The older sequence is a group of shallow-marine limestones, cherts, and cherty limestones that are Kinderhookian, Osagean, and Meramecian in age (fig. 7). Many of the groups of rocks targeted in the Mississippian limestone play are part of that sequence. The Cowley formation--a cherty, fine-grained limestone that commonly has interbedded shale--is also part of the older sequence in south-central Kansas. Despite its economic potential, the Cowley's stratigraphic relationship to the shallow-water limestones is ambiguous and under debate (Mazzullo et al., 2009). Whereas the Cowley may be equivalent in age to other rocks in the Mississippian limestone play, it could represent a deeper-water deposit. Figure 7--Mississippian nomenclature in Kansas as proposed by Maples (1994). The Mississippian limestone play includes rocks that range in age from Chesterian to Kinderhookian but are predominantly Osagean. The Cowley formation, whose stratigraphic relationship to other rocks in the play is still under debate, may be found in place of all or part of the interval of rocks from the lower St. Louis Limestone to the Chattanooga Shale (Maples, 1994). The younger Mississippian lithologic sequence consists of marine and nonmarine shales and sandstones with minor limestones that are Chesterian in age (Newell et al., 1987). Widespread in Oklahoma, Chesterian rocks extend into only a handful of southwestern Kansas counties (Stanton, Grant, Haskell, Morton, Seward, and Meade). Hundreds of fields throughout the southern half of Kansas include Mississippian production zones (fig. 4). Oil, without significant gas, has been produced from the Mississippian on the flank of the Hugoton embayment southwest of the Central Kansas uplift. Mississippian production dominates on the flanks of the Nemaha uplift and western side of the Cherokee basin. Gas, and associated oil and gas production, occur on the Pratt anticline, in the Sedgwick basin, and in the Hugoton basin near the Kansas-Oklahoma state line. Scattered gas production occurs farther east (Newell et al., 1987). Although much of the oil in Kansas has been produced from zones older and younger than the Mississippian along the crests of the Central Kansas and Nemaha uplifts, Mississippian production is still substantial in the state. Since 1970, 12% of the state's total oil production came from Mississippian zones (fig. 8). In 2012, 15% of the production was Mississippian. Figure 8--Oil production by geologic unit in Kansas since 1970 (based on production numbers from the Kansas Department of Revenue). In 2010, renewed interest in the Mississippian play in southern Kansas emerged even as production from vertical wells there continued to decline. The norm in hydrocarbon exploration and development for decades, vertical wells are sunk directly downward into oil- or gas-bearing reservoir rocks ("pay zones"). Because a vertical hole has limited contact with any given zone, more oil or gas is usually left in a reservoir than is produced over the typical multiyear lifespan of the well. In contrast, horizontal wells now drilled in southern Kansas more precisely target potential pay zones. The wellbore of a horizontal well turns gradually from vertical to horizontal over a few hundred feet before continuing through a target zone. Boreholes can be drilled horizontally for 10,000 feet (3,048 m) or more, though to date most Kansas wells extend horizontally only 2,000 to 3,000 feet (610 to 914 m). Multistage hydraulic fracturing, used in combination with horizontal drilling, is applied along the horizontal segment of wellbore to crack the rocks and provide access to oil trapped in unconnected pores. Poor drainage in hydrocarbon production of the Mississippian limestone reservoirs has hampered its oil-field development for decades. Rocks in the play often have excellent porosity due to numerous and large pores but are plagued by poor permeability, where pores are isolated from each other or poorly connected. Low permeability results in poor hydrocarbon recovery with traditional methods. Horizontal drilling and hydraulic fracturing together provide better access to isolated hydrocarbon-bearing pores and, as a result, better hydrocarbon recovery. Three-dimensional seismic imaging also has become an integral part of the exploration process. Before drilling, exploration companies often send seismic (sound) waves into the ground and measure the rebounding energy with a widespread grid of electronic receptors called geophones. The sound waves reflect off different rocks and layers in different ways to create a 3-D image of the subsurface. Seismic reflection helps identify potential oil and gas sources before drilling begins. Most of the production in the Mississippian limestone play in Kansas has occurred at or near the top of the Mississippian rocks still present, particularly from the chat. Thickest on the flanks of the Central Kansas uplift and Pratt anticline, the cherty beds can be quite variable in reservoir characteristics. The porosity and permeability of the beds have been hard to predict, and overlying conglomerates at the base of the overlying Pennsylvanian rocks, which may also serve as reservoir rocks, are difficult to distinguish from the chat (Newell et al., 1987). The Mississippian play encompasses several units that were not well differentiated in the past, and questions still remain about the geologic structure of the reservoirs involved as well as the subtle but important depositional relationships of some of the Mississippian beds. Subtle stratigraphic traps, attributable to the varying reservoir quality of the chat and overlying basal Pennsylvanian conglomerates, are targets for horizontal-drilling exploration in the area centered on Harper, Barber, and Comanche counties (Newell et al., 1987). Mississippian limestone reservoirs have also been targeted for exploration farther north and west in Gove, Ness, Lane, and Reno counties. Oil companies have to reckon with an economic tradeoff when they choose to drill a horizontal well in the Mississippian limestone play. A horizontal well is expensive, costing up to 10 times more than a vertical well. A company choosing to drill a horizontal development well is thus betting that one horizontal well will be less expensive to drill than several vertical wells and that it will have better rates of production and hydrocarbon recovery over its lifetime. Historically, smaller, mainly local, independent companies have drilled most of the oil and gas wells in Kansas because profit margins and production rates and volumes rarely attracted national or international companies. About 2010, however, larger regional and international companies started leasing substantial acreage in Kansas with the idea that oil-bearing Mississippian strata could be best developed with the more expensive horizontal wells and multistage hydraulic fracturing. The main companies were Oklahoma-based SandRidge Energy and Chesapeake Energy as well as Shell Oil Gulf of Mexico. Shell GOM is a subsidiary of Shell Oil, which has had limited activity in Kansas after 1950 and last drilled in the state in 1984 (Hall, 2012). Following successes in the Mississippian play in Oklahoma, activity spread into southern Kansas, and several companies bought or leased mineral rights from southern to northwestern Kansas. The economic impact that drilling in the Mississippian play could have on the state is unclear. The Mississippian limestone is shallower and easier to fracture than the Bakken shale in North Dakota and Montana or the Eagle Ford Shale in Texas, but the Mississippian produces much more saltwater, which must be disposed of (Hall, 2012). Most companies are still experimenting with optimizing production rates and hydrocarbon recoveries and, concomitantly, minimizing costs. In addition to the multiple uncertainties and risks inherent in the industry, fluctuations in the price of oil and gas have a major influence on decisions to explore and drill in the state. Beyond the impact on the oil and gas industry, booms related to rapid, large-scale development can significantly affect surrounding communities. Largely due to job opportunities related to soaring production in the Bakken, North Dakota's unemployment rate of 3.2% in December 2012 was the lowest in the country (Bureau of Labor Statistics, 2012). On a less positive note, the oil-boom town of Williston experienced infrastructure problems, housing shortages, an increased cost of living for long-term residents, and strains on public-safety, education, and social services. Concerns about potential problems brought on by increased activity in the area centered on Barber, Harper, and Comanche counties in south-central Kansas have prompted state and local governmental units to institute collaborative planning with industry representatives (Hall, 2012). Topics of discussion include housing shortages, infrastructure deficiencies--especially inadequate roads and sources of electrical power--and surface water and groundwater availability. The source of freshwater needed for hydraulic fracturing and drilling is of particular concern in this region with limited water resources, as is the safe disposal or treatment of fracturing fluids, drill cuttings, and saltwater removed during drilling. The Kansas Corporation Commission (KCC) is the main state governmental agency in charge of regulating exploration and production of oil and gas in Kansas, with primary responsibilities falling to the agency's Oil and Gas Conservation Division (KCC, 2013). Established by Kansas statute, a 12-member Oil and Gas Advisory Committee representing industry, landowners, and other interested parties reviews and makes recommendations on the Oil and Gas Conservation Division's rules and regulations. The KCC's rules and procedures related to exploration and drilling encompass intent-to-drill and production reports; casing and cementing standards; preservation of well samples, cores, and logs; environmental issues; abandonment of wells and plugging procedures; storage requirements; and safety plans and inspections. Federal regulators include the Environmental Protection Agency (EPA) and the Department of Labor's Occupational Safety and Health Administration (OSHA) (Hall, 2012). The Kansas Department of Health and Environment (KDHE) Bureau of Air issues permits for air emissions related to horizontal drilling, and the KCC Underground Injection Control Program oversees the permitting of injection wells. Spills during oil and gas activities must be reported to the KDHE, KCC, Kansas Division of Emergency Management, and/or other state and federal agencies, depending upon the material and volume spilled (KDHE, 2013). Direct diversion of surface water or groundwater for oil and gas production and hydraulic fracturing requires a permit from the Kansas Department of Agriculture's Division of Water Resources (DWR, 2013). To address issues related specifically to activity in the Mississippian limestone play, the state formed the Inter-Agency Working Group (IAWG) with representatives from the KCC; Kansas Geological Survey; Kansas Departments of Agriculture, Transportation, Revenue, Health and Environment, and Wildlife, Parks and Tourism; Kansas Water Office; Kansas Attorney General's Office; and the Kansas Housing Resources Corporation (Kansas Department of Commerce, 2013). An Industry Advisory Group and a Community Advisory Group also were organized. Available from the KGS and online at http://www.kgs.ku.edu/Publications/pubCirculars.html. Blakey, R., 2010, Late Mississippian Paleogeography of North America: Colorado Plateau Geosystems, Inc., map, http://cpgeosystems.com/paleomaps.html. Bureau of Labor Statistics, 2012: United States Department of Labor, http://www.bls.gov/web/laus/lauhsthl.htm. DWR, 2013, Water permits for oil, gas production and hydraulic fracturing: Kansas Department of Agriculture, Division of Water Resources, http://www.ksda.gov/dwr/cid/1979. Franseen, E. K., 2006, Mississippian (Osagean) shallow-water, mid-latitude siliceous sponge Spicule and Heterozoan Carbonate Facies--An example from Kansas with implications for regional controls and distribution of potential reservoir facies: Kansas Geological Survey, Bulletin 252, pt. 1, 23 p., http://www.kgs.ku.edu/Current/2006/franseen/index.html. Hall, A. P., 2012, The Kansas oil and gas industry--An enduring model of high-tech entrepreneurship: University of Kansas School of Business, The Center for Applied Economics, Technical Report 12-1116, 95 p., http://www.business.ku.edu/publications-0. International Commission on Stratigraphy, 2012, International stratigraphic chart (August 2012): http://www.stratigraphy.org/index.php/ics-chart-timescale. Kansas Department of Commerce, 2013, Kansas oil and gas activity in the Mississippian Lime Play: http://www.kansascommerce.com/index.aspx?NID=520. KCC, 2013, Oil and Gas Conservation Division: Kansas Corporation Division, http://www.kcc.state.ks.us/conservation/index.htm. KDHE, 2012, Division of Environment: Kansas Department of Health and Environment, http://www.kdheks.gov/environment/index.html. Maples, C. G., 1994, Revision of Mississippian stratigraphic nomenclature in Kansas, in, Revision of Stratigraphic Nomenclature in Kansas, D. L. Baars (compiler): Kansas Geological Survey, Bulletin 230, p. 67-74. Mazzullo, S. J., Wilhite, B. W., and Woolsey, I. W., 2009, Petroleum reservoirs within a spiculite-dominated depositional sequence--Cowley Formation (Mississippian: Lower Carboniferous), south-central Kansas, AAPG Bulletin, v. 93, no. 12, p. 1,649-1,689. Newell, K. D., Watney, W. L., Cheng, S. W. L., and Brownrigg, R. L., 1987, Stratigraphic and spatial distribution of oil and gas production in Kansas: Kansas Geological Survey, Subsurface Geology Series 9, 86 p., http://www.kgs.ku.edu/Publications/Bulletins/Sub9/index.html. Watney, W. L., Guy, W. J., and Byrnes, A. P., 2002, Characterization of the Mississippian Osage chat in south-central Kansas: Kansas Geological Survey, Open-file Report 2002-50, http://www.kgs.ku.edu/PRS/Poster/2002/2002-50/index.html. Anticline--A fold of rock layers, raised generally upward, in which the older layers are in the core of the fold. Anticlines can be as small as a hill or as large as a mountain range. Petroleum can concentrate at the crest of an anticline in what is called a structural trap. Basin--A low-lying area in which thick sequences of sediments have accumulated. Five basins, divided by uplifts, are found in the subsurface of Kansas (fig. 4). Central Kansas uplift--A broad and complex structural high that trends northwest to southeast across north-central Kansas (fig. 4) and is now found only in the subsurface. Raised about 320 million years ago at the end of the Mississippian and beginning of the Pennsylvanian, the Central Kansas uplift is the largest structural feature in Kansas. Chat--An informal name for the residual cherty, porous, weathered limestone zone in the Mississippian play. Chert--Commonly called flint, chert is a fine-grained, microcrystalline sedimentary rock made up of silicon dioxide (SiO2)--the same chemical formula as the mineral quartz. Usually found as rounded nodules in limestone and dolomite or, less often, an extensive layered deposit, chert is harder and more resistant to erosion than limestone. Horizontal drilling--Drilling that starts out vertical then gradually turns in a horizontal direction to extend a greater distance into a known oil-producing zone. Hugoton embayment--The northwestern shelf area of the Anadarko basin (fig. 4). The Hugoton gas field of western Kansas is the largest conventional gas field in North America. Hydraulic fracturing--Injection of fluids and sand into a well to fracture oil-bearing rock layers. Colloquially called "fracking," especially when used in conjunction with horizontal drilling, hydraulic fracturing increases permeability in rocks to free trapped oil. Lithologic--Relating to lithology, which is the description of a rock based on such physical characteristics as color, mineral composition, texture, and grain size. Nemaha uplift--A complexly folded and faulted northeast-trending structural high in east-central Kansas (fig. 4) that formed about 320 million years ago at the end of the Mississippian and beginning of the Pennsylvanian and extends into Nebraska and Oklahoma. Permeability--The capacity of rock, soil, or sediment to transmit fluid through connected pores. Play--A set of oil and/or gas accumulations and reservoirs that share a geologic setting within a defined geographic area. Porosity--The ratio of the combined volume of pores in a rock to the rock's total volume, usually expressed as a percentage. Porous rocks are permeable only when the pores are interconnected. Stratigraphic trap--A trap for oil or gas created by changes in rock lithology rather than from a structural deformation, such as when an impermeable cap of shale traps oil that has moved up through an underlying layer of permeable sandstone. Syncline--A generally downward fold of rock layers, in which the younger rocks are in the core of the fold.